The Ecore Tools component provides a complete environment to create, edit and maintain Ecore models. This component eases handling of Ecore models with a Graphical Ecore Editor and bridges to other existing Ecore tools (Validation, Compare, generators...). The Graphical Ecore Editor implements multi-diagram support, a custom tabbed properties view, validation feedbacks, refactoring capabilities... The long-term goal is to provide the same level of services as does JDT for Java. See Ecore_Tools/New_and_Noteworthy for a summary of its features and functionality. EcoreTools is a modeler defined using the Eclipse Sirius project. ./src/org/eclipse/emf/ecoretools/design/service : some small java utilities used by the editor specification. Properties views and embedded wizards are defined in the plugin org.eclipse.emf.ecoretools.design.properties which is generated using the EEF project. Doc Table support : ability to edit doc annotations using a table. Smart direct Edit : type "name:String", or "", or ":Integer" and the modeler will figure what you meant. EOpposite support : EOpposite References are displayed in the diagram as multi-role edges. Validation layer : The diagram editor can be configured so that any validation Error will be highlighted in the shape. Multi-Ecore : a diagram can represent elements from distinct Ecore files. 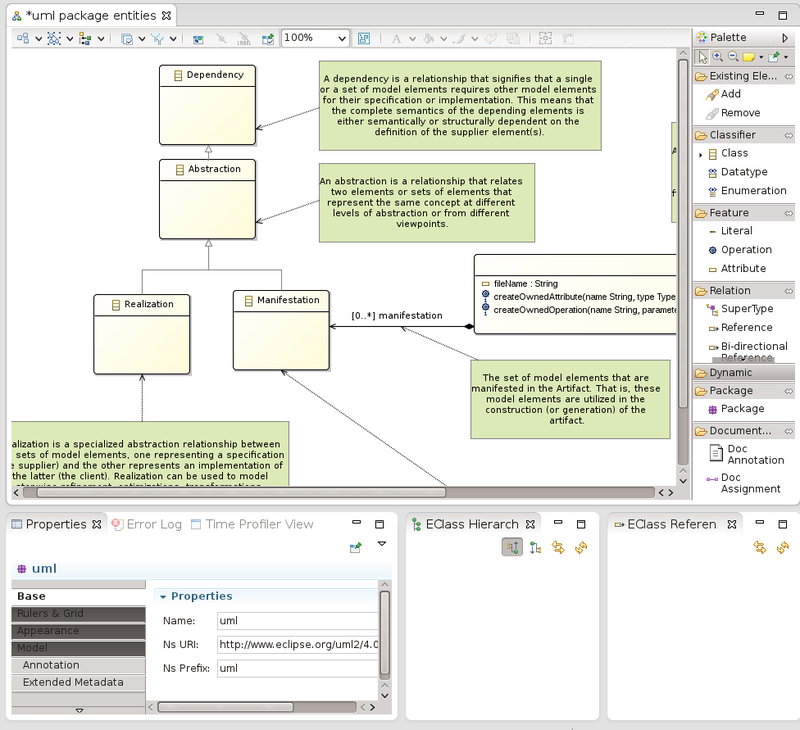 Dependencie View : a diagram editor to inspect inter-EPackage dependencies. Use the Eclipse Luna update-site. Ecore Tools 2.0 was shipped in on June 25, 2014 and is part of the Luna Simultaneous release. Any help is welcome ! Any issue should be reported to the Bugzilla > EMF: Tools. You may also contact the team using the EMFT newsgroup. This page was last modified 02:32, 27 June 2014 by Hendy Irawan. Based on work by C, David Rees and Vincent H and others.